The first Airbus A321neo has completed its maiden flight, from the Airbus final-assembly facility at Finkenwerder Airfield near Hamburg. Registered D-AVXB, the aircraft was flown by Airbus Experimental Test Pilots Martin Scheuermann and Bernardo Saez Benito Hernandez. Accompanying them in the A321neo’s cockpit was Test-Flight Engineer Gérard Leskerpit and monitoring the flight’s progress were Flight-Test Engineers Sandra Bour Schaeffer and Emiliano Requena Esteban. The A321neo’s maiden flight lasted five hours and 29 minutes, during which tests were performed on both high and low engine speed variation and on systems behavior. Tests were also performed during the first flight to validate the aircraft’s flight envelope. The A321neo will join the A320neo-family flight-test fleet and will perform a partial flight-test program to validate its handling qualities, performance and systems. The manufacturer chose to outfit the A321neo with CFM International LEAP-1A engines for the type’s first flight. Airbus reportedly made this decision because Pratt & Whitney has experienced supply-chain difficulties which have prevented it from delivering PW1100G-JM geared-turbofan engines in sufficient quantities to meet current A320neo and A321neo production requirements. 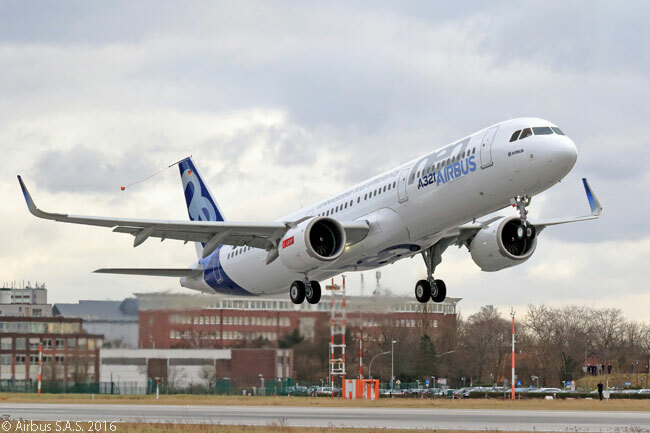 The first A320neo performed its first flight with PW1100G engines and the A320neo subsequently initially won type certification for operation with the Pratt & Whitney engines. The A321neo is the largest member of the A320neo family. By the end of December, Airbus had won firm orders for 1,094 A321neos and total firm sales of the two A320 families (the A320ceo current-engine option family and the A320neo new-engine option family) had reached 12,411 aircraft by that date. To date the A320neo-family flight-test campaign has accumulated some 1,900 flight hours in more than 640 flights, since the first flight of the A320neo on September 25, 2014.